One choice can transform you-- or it can destroy you. But every choice has consequences, and as unrest surges in the factions all around her, Tris Prior must continue trying to save those she loves--and herself--while grappling with haunting questions of grief and forgiveness, identity and loyalty, politics and love. I'm going to repeat what I said in my review of the first book of the Divergent series: this is a case where I'm sure the movie will be better than the book. 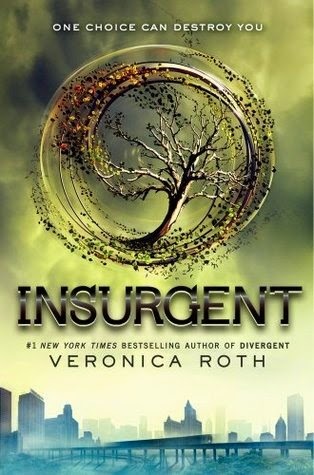 After reading Divergent, I had decided I wouldn't read the rest of the trilogy, but instead would wait for the movie. Then, my husband and I watched Divergent (which I thought was mediocre, but my husband enjoyed) and my non-reader husband wanted to know what happens next. That, of course, meant I had to read Insurgent (not him, of course). So, I did--because I'm a good wife. In retrospect, I probably just should have waited to see the movie. This is one of those books that drives me crazy--it's not so much a novel as an outline for a motion picture. It has everything one could want in a movie--action, romantic tension ("I love you, but I can I trust you?" "Is he going to break up with me over this?" etc. ), and a self-conflicted heroine. Well, maybe not that last part. I think Roth tries very hard to make Tris into Katniss 2.0, but she fails. Katniss doubts about herself arise from her backstory and what has happens to her as the story develops and seems very organic and believable. Tris's are, well, they just sort of appear for no reason that I can find out. Roth's writing is clear, but basic. I hesitate to say this, but when people criticize young adult fiction, this is the kind of book they are talking about (and, to be clear, there is a plethora of wonderful YA literature out there). I really wanted more depth here, I wanted more back story--things like more of an insight into Caleb's and Tris's earlier relationship or more details of Tobias's pre-Dauntless life would have amplified the story. There were also some weird inconsistencies. For example, at one point Tris is put into a "time out" room in one of the factions. About 50 pages later, Tris mentions that the factions have these time out rooms, but she's never been in one. Uh.....weren't you in one a few chapters earlier? I found the characters really flat and, at times, ridiculous. Tris, who was somewhat interesting in Divergent, seems to have been demoted to a horror film heroine. She opens a door, thinks that it is a bad sign that the door is unlocked, and continues to walk right through it. The only difference is that she'd have been killed in a horror movie fifteen minutes in. Here, however, was my biggest problem with the book was the fact that much of it was just unnecessary. There is an episode of The Big Bang Theory where Amy destroys Sheldon's world by pointing out that the character of Indiana Jones is completely superfluous to the Indiana Jones movies. Everything that happens in those movies would have happened if he weren't part of that. That is sort of how I felt about the action in this book. There are several confrontation and action scenes, but nothing ever comes out of any of them. The next confrontation would have happened anyway if the previous one hadn't. Instead of a plot, it seems like this is just a string of rather unrelated incidents. Honestly, to get from the beginning to the end of this book, you only need about 1 confrontation and even that one is pretty straightforward. Okay, after all this complaining, I will say that there are 2 positives about his book. It did keep me reading it, even if it was sometimes out of disgust. Secondly, I am interested to see how the trilogy ends now. I could wait for the movies (because we all know that there are 4 movies in a trilogy now....), but it would probably be faster to just bite the bullet and read Allegiant. Maybe I will, after I get the taste of this one out of my mouth.